Today on the occasion of your Vyasa Puja it is with great pleasure I report to you that once again hundreds of thousands of people have received the great mercy of Lord Caitanya Mahaprabhu on the Baltic Sea coast in Poland. That mercy has taken the form of your books, the holy names, prasadam distribution, and the blissful association of many wonderful devotees. I try to document the great success of the samkirtan movement in Poland in my diary chapters, but the wonders taking place are far too numerous and extraordinary to capture in language. We witness great miracles on a daily basis as people receive your mercy through our humble efforts. Like the people who come to our festivals, I too was entangled in the vicious cycle of birth and death before I met you. I also experienced the onslaughts of suffering in this material world and I thus understand the great relief people feel when they come into contact with you and your movement. I saw this relief recently in a well-dressed gentleman who approached me with a Bhagavad-gita that he had purchased after my lecture at one of our festivals. As he was asking me to sign it he spontaneously reached out and embraced me. As I put my arms around him to reciprocate, he began crying. He hugged me for a full minute, his body shaking with sobs. Then he stepped back and wiped the tears from his face. I accepted his gratitude on your behalf, Srila Prabhupada, because I know that the relief he felt was a product of your mercy. The burden of suffering borne by those in the material world is gradually being alleviated by you, the greatest acarya of modern times. No doubt the Lord could have delivered all the fallen souls Himself 500 years ago in His incarnation as Sri Caitanya Mahaprabhu, but out of love He gave this sacred duty to you, and out of your infinite kindness you have entrusted it to us, your disciples and followers. I take my responsibility to this sacred duty very seriously, especially now in the autumn of my life. Each day I sharpen my focus on delivering as many conditioned souls as possible to your lotus feet before I leave this mortal frame. was the very purpose of your life. You lived and breathed your Guru Maharaja's order to spread Krsna consciousness all over the world. Since your departure, many of your disciples have tried to keep that flame burning. For my part, this determination is manifest in our festival program in Poland, the results of which we offer daily at your lotus feet. Like anything in this world, those results are sometimes big and sometimes small, but even small achievements demonstrate your ongoing success in introducing lost souls to your Lord. Just the other day Prahlad Nrsimha das read the chart of a gentleman who visited his Astrology Tent at our festival. When he mentioned that the man had a strong propensity for law, the man laughed. “You're right!” he said. “I'm the chief magistrate in Poznan, one of the larger cities in Poland.” He later left the Astrology Tent with a Bhagavad-gita and chanting beads in hand. That same evening during the final kirtan, I watched a lady rush to our Restaurant Tent from a nearby apartment building in her pajamas and a long robe, her hair in curlers. For a moment I thought the building might be on fire, but a few minutes later she headed back to her apartment armed with two plates of prasadam. 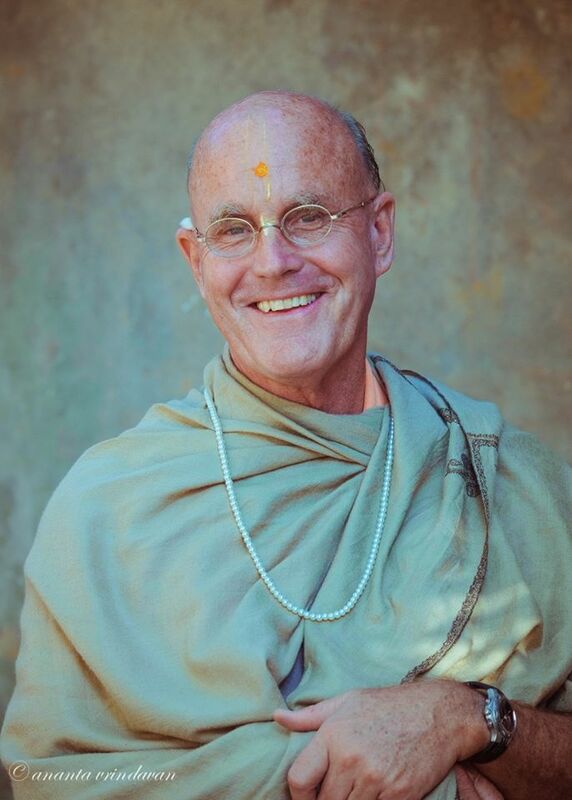 After the festival, our cook Rasikendra dasa told me she had just returned from a long business trip overseas. She had taken a nap early in the afternoon and was woken up at 9.30pm by our loud kirtan. Srila Prabhupada, these small exchanges show how people are attracted to Krsna Consciousness when it is presented in an appealing way. You once said, “We will conquer the world with culture.” Here on the Baltic Sea coast, we conduct our festivals with this axiom in mind. Expanding on the basic principles of chanting, dancing and feasting, our festival tour has become a major attraction each summer. Resorts compete to have our event at prime times of the season and many tourists plan their vacations so that they can attend our festivals as we travel along the coast. I pray that all the devotees on the tour will have the privilege to serve you in this way for many years to come. We often recount the words of the harbor-master of Mrzezyno, a port town we visit each year. Seeing the success of our festival in his town he pronounced a blessing: “May these festivals go on for 100 years!” But to be successful in this service, we need your mercy and help to convince the general populace of the foolishness of material life and the beauty of the Absolute Truth. With all honesty I can say that I will not be able to live in separation from these festivals which pour the mercy of the Divine Couple upon the conditioned souls. I pray that when this great event winds down, you will send me to another place, perhaps beyond this world, where even more fallen souls are drowning in the ocean of material existence. I do not mind if it is dark and cold, fiery hot, in heaven or in hell, for as long as we can organize another festival of love and bliss, the conditioned souls there will rise above their miseries and dance in ecstasy to the holy names. It has been done before; why not again? I know how much you desire this movement to be spread. Therefore, as your disciple, I promise to continue working day after day, month after month, year after year towards fulfilling your mission.